Given his notorious persnicketiness, I should probably say 'David O. Russell's latest' from here forward, for I fear that if I simply say 'Russell's latest,' he may find a way to reach through my computer screen and slap me violently across the face for behaving informally. I shall do my best, therefore, to demonstrate sufficient fealty and deference forthwith while reviewing his latest submission for consideration by the Academy, namely, Christmas Day's Joy starring Jennifer Lawrence, Bradley Cooper, Robert De Niro, and many more. Most recently heralded for 2013's American Hustle and 2012's Silver Linings Playbook, Russell fancies himself an auteur, and I don't disagree with that self-assessment one iota. He absolutely is, in the same way Coppola, Scorsese, Spielberg, Lucas, Tarantino, and the Coen brothers are, too. On the whole, it's rarified air, enabling tonal consistency from concept and casting through to music and marketing. Like any auteur, however, when it works and clicks and succeeds, well, s/he deserves a great portion of the credit. And when it fails, well, there is nowhere to look but in the mirror. Joy does not fail completely, but it only periodically succeeds. Before going any further, I should probably mention that I absolutely loved Hustle and Playbook. Furthermore, I am among the most ardent fans of Jennifer Lawrence, Bradley Cooper, Robert De Niro and, for what it's worth, Isabella Rossellini, Diane Ladd and, to a somewhat lesser extent, sure, Virginia Madsen as well. But we'll get to them and their Oscar potential momentarily. I should also mention that Russell got on my bad side when he appeared on my beloved Charlie Rose on December 18th and behaved like a bratty houseguest who forgot his place. You know the type: one who was born on third but thinks he hit a triple. The sort who arrives and directs everyone else, issuing orders for how the dishes should be washed, the carpet vacuumed, the laundry folded. A poor guest overall, reminiscent of the obnoxious know-it-all boy in The Polar Express. Charlie began with his usual questioning (as any interviewer is prone to do), and Russell rather abruptly turned the table on him, asking his own questions of tablemates Cooper, De Niro, and Ramirez—behaving as if it was The David O. Russell Hour—and leaving Rose to participate as some second banana. Ugh. It really tied a knot in my knickers, and I haven't quite forgiven Russell for his impertinence yet, so caveat emptor as you ponder the following ruminations. 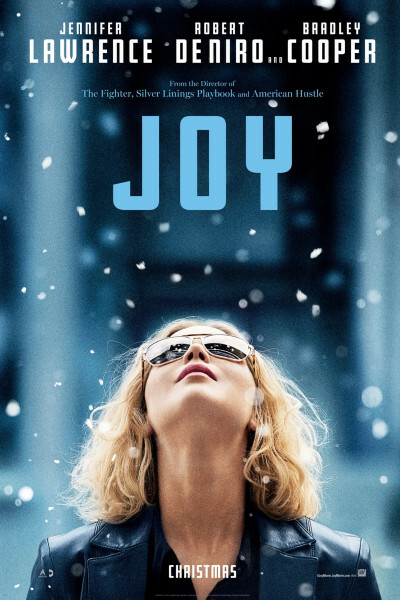 Because one cannot unsee what has been seen, it was difficult for me to watch Joy and not perceive Russell's controlling nature everywhere. It appears to have penetrated every nook and cranny of the film, oozing from each scene and interaction. And the scenes and interactions are fine, as are those in most gifted auteur's movies, but sometimes it's just enough. Too self-aware, too self-absorbed, too self-indulgent, too controlling, too contrived, too everything, like a too perfect snow globe we'd escape from if only given the chance. Observing his carefully crafted, eccentric, over-the-top menagerie of characters on display here, I wondered for a moment if I'd stumbled into some Wes Anderson film exhibit in Vegas, à la The Royal Tenenbaums meet Steve Zissou at Grand Budapest. Joy is that heavily costumed and art directed, though I doubt the puppeteer intended for us to so noticeably see his strings. Or maybe he did, and was enamored by the engineering? Ironically, I found it an altogether eerie case of art imitating life, Lawrence and one or two of her castmates out-juking the director's obvious game plan and formidable defenses and improvising their way to a wild break up the sideline to put six unscripted points on the scoreboard. Contrary to the title, the general atmosphere of the film is claustrophobia. For ninety minutes it is outright smothering, despite being apropos, authentic, and narratively true (if only because one's journey to 'joy' surely necessitates—both here and in real life—bouts with and degrees of wandering, wondering, wasted time, squandered potential, familial responsibilities and obligation, and emotional and relational imprisonment). By the time our heroine finally sees her situation for what it is—with clear eyes, a strong heart, and a renewed sense of purpose and urgency—the moment to pivot has passed for almost everyone involved, including the audience. There is no denying this is a fastidiously, lovingly crafted film, replete with some pitch-perfect acting, but it's virtually too little, too late. A proverbial exercise in futility. Russell's vacuum has so effectively and thoroughly sucked all the oxygen out of the room in the first 2/3rds of the film that there is insufficient time to throw a good Hail Mary; the return on his investment becoming negligible, if not altogether nil. I was emotionally ready for Act III to kick-in 15 to 20 minutes sooner and so, by the time it finally did, I was over my desire for it: ready, instead, for it all to simply end; ready for dysfunctional and sometimes Machiavellian family members to get theirs; ready for Cinderella to get hers; unquestionably ready for us—as an audience—to get our just reward for having accompanied Russell on this fool's errand. A miss that may as well have been a mile. The payoff does arrive, kind of, but in such a complicated, messy way as to leave you feeling very conflicted about it. Happy, relieved, hopeful...and also infuriated, angry, resentful, bitter, disillusioned, hopeless. Perhaps that's as it should be and precisely what the master intended, a perfect Rorschachy representation of life's mirrored vistas and valleys. But given the preamble preceding the film, I do not believe this is what the master intended at all. Maybe it's just a swing and a miss by a director who too cockily overplayed his hand or outpunted his coverage, keeping us in the dark for so long that it's hard to want the light when it arrives. An overestimation of the attractive forces of his work product (as also experienced in Terrence Malick's 2012 sacrifice, To the Wonder) and an underestimation of the insane amount of fuel and positive thrust required to overcome such sustained, downwardly directed emotional gravity. One gets so dang full on Russell's bread that the mere mention of soup, salad, appetizer, entree, dessert, and after-dinner drinks sounds really discomforting. "Check, please!" Fortunately, here—as in life—there are still object lessons galore, not the least of which is this: you miss every pitch you don't swing at, so take a page from Joy's handbook and swing away. Just remember when you grab a bat that life is a team sport, so should you feel inclined to try and control everything and everyone—stage-handling the whole affair—well, you just might get exactly what you bargained for...and nothing more.